In our buying guide, The Best Trench Coats For Men, we provide you with some of the best men’s trench coats you can buy for the money. If you’re asking who makes the best men’s trench coats, then there are two brands up for debate. They are probably the two best men’s trench coat brands and they are both iconic offerings from the UK. We also show you a less expensive, more recent American offering, an offering for the budget minded from a well-known brand, and something for those looking for a little style. But before starting let’s take a look at the history of the Trench Coat. The trench coat as we know it was a product of the first world war. The developed the Trench replace heavier coats worn by British and French soldiers. Two British brands, Burberry and Aquascutum claimed this relatively modern invention in the 1850. The Modern Trench adopted many of the features we see today during the first World War. Shoulder straps attach epaulets or rank insignia. The D-ring attached map cases and swords to the belt. Large exterior pockets held maps, while cleverly placed flaps and vents dealt with odors associated with early rubber models. So without further ado, lets take a look at our top 5 men’s trench coats. If you’re serious about buying a Trench Coat, then you’re going to want to pay close attention to both Burberry and Aquascutum. These Trench Coat brands are classics and will stay in style for a lifetime. 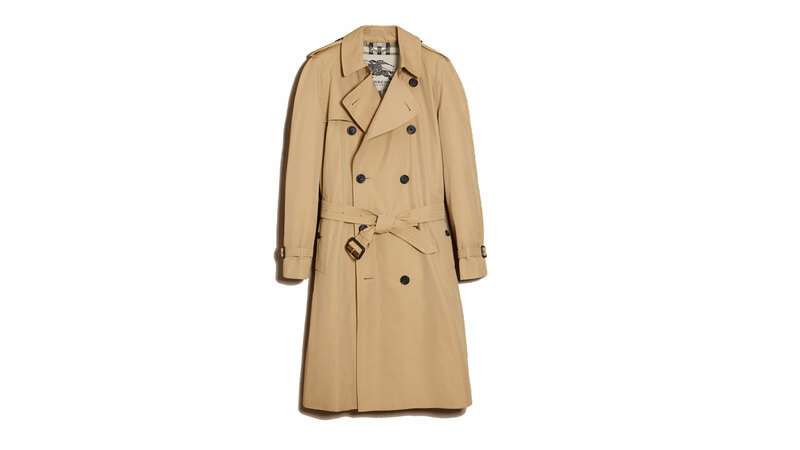 The Burberry Men’s Westminster Trench Coat ($1895) is a classic fit trench from England. 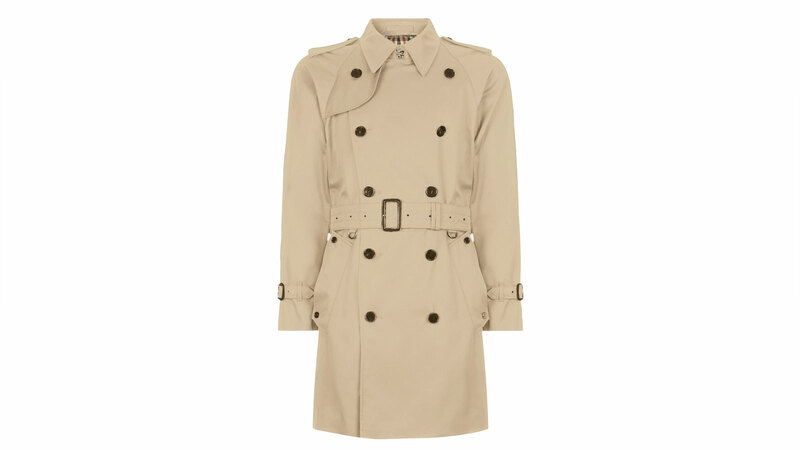 Created from a weatherproof cotton gabardine invented by Thomas Burberry in 1879. Whether needed for rainy weather in the spring or layered with a shirt jacket or jean jacket in the fall, the Burberry Westminster is a great choice. Aquascutum is another century-old English brand. It originally started as a tailor in 1851. Since the beginning, the brand has been at the forefront of craftsmanship and technical innovation. One of their best coats is the Aquascutum Corby Double Breasted Men’s Trench Coat ($1190). The Corby is double breasted trench meticulously crafted in the United Kingdom from a cotton mix. It features raglan sleeves, with military-inspired epaulets, and a waist belt. The American Trench Men’s Trench Coat ($795) is a beautiful trench coat from the U.S. based brand. It only launched in 2012, but the brand has quickly gained recognition for its craftsmanship and styling. Workers coat and sew the coat at a factory in New Jersey. It features a shell made from Ventile cloth, made from American grown Supima cotton woven in the UK since 1943. Because of the tightness of the Ventile cloth’s weave and with the addition of a DWR coating, the coat is water repellent but still breathes. The interior features 100% cotton and lined with a glen check pattern woven in North Carolina. For just $795 you’ll be hard press to find a better bang for your buck. The J. Crew Men’s Ludlow Double-Breasted Water-Repellent Trench Coat ($300) is our choice for a budget trench. This trench comes in multiple sizes. And features a shell made from bonded layers of cotton with a partial lining. This setup provides a water repellent shell that is perfect for those occasional downpours. It features a fold-down collar, waist and interior pockets, and functional buttons at cuffs. If you’re looking to save a couple bucks the J. Crew Ludlow Trench would be a great option. 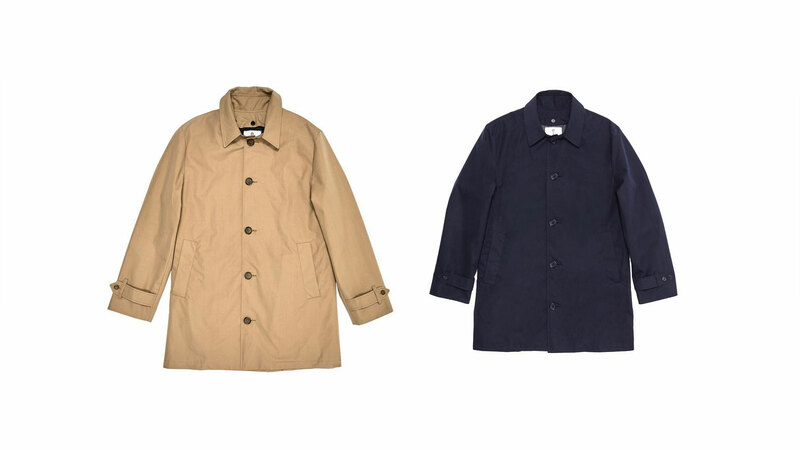 Known for its stylish menswear, Todd Snyder also makes one of our favorite Trench Coats. The Todd Snyder + Mackintosh Belted Dornoch Trenchcoat ($1200) is an absolutely beautiful coat. The Dornoch is a collaboration between the Todd Snyder team in Japan and famed outerwear producer Mackintosh. If you want this coat you’ll need to hurry because it’s available in extremely limited quantity and will run out soon. This standout outerwear piece is made in Scotland, woven in an olive twill and finished with a double-breasted closure and belt. The twill shell is completely waterproof. A beautiful addition to any wardrobe. 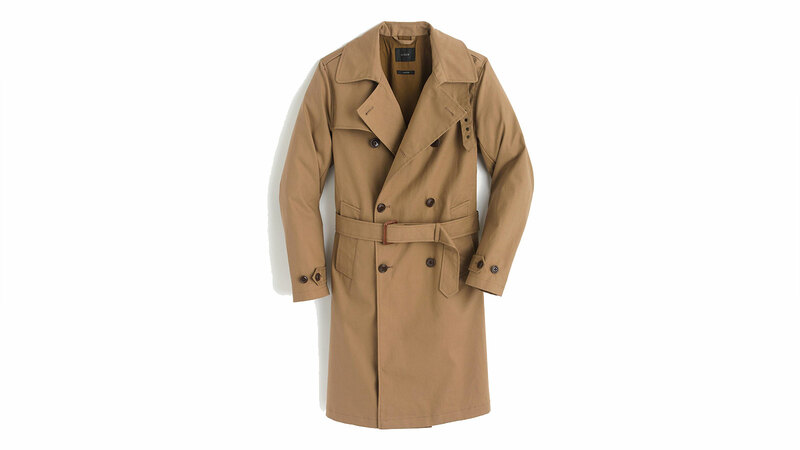 The Uniqlo Men’s Trench Coat ($150) is very formal-looking and reminds one of the original military trench coats. It is among the more expensive coats on our list, so expectations are naturally pretty high. The coat is made of a thick and wrinkle-resistant fabric, which is a blend of cotton and polyester. This coat fastens with either buttons or a belt. One of the best features about this coat is the soft elastic-like lining. Not only does this give a little bit of extra insulation in the winter, but it also feels good against the rest of your clothing and provides minimal friction. This coat is available in either navy blue or khaki. The ASOS Double-Breasted Men’s Trench Coat ($95) looks a lot like our previous entry, except that this one is obviously meant to look a bit more casual. The ads show a man wearing it in a haphazard, careless way, and the design of the coat seems to lean in the direction of a semi-formal look. This coat is only available in one color (navy blue), but this is a color that matches with nearly anything. The large buttons line the sides in an elegant way that makes one think of a pirate captain getting ready to plunder something on the high seas. It isn’t a cheap coat, but it isn’t terribly expensive when you consider its thick weave and high durability factor. The London Fog Double Breasted Men’s Trench Coat ($100) is a classic and attractive design that makes me think of Sherlock Holmes every time. Apart from the great look of this coat, it also does a great job of resisting the rough conditions of the weather. The belt is kind of floppy, giving you the choice of either buckling or tying. Either of these might be a good choice depending on the look you are trying to achieve. Although most people won’t need it, this coat also has “functional gun flaps.” These are intended to hold an object securely in place while at the same time allowing for easy access. The Topman Single Breasted Men’s Trench Coat ($120) is a very modern type of trench coat. At first glance, it doesn’t even remind me of any trench coat that I have seen before. The whole thing presents a very urban look and sports a very plain design with only two external pockets. Thankfully, it still has an internal pocket for those hidden items. There is no ornamentation to be found on this coat. This minimalist appearance is well-suited for some styles and the tastes of some individuals. This is the second-most-expensive coat on our list, so make sure you really want this coat before you lay the money down. The coat is made from a blend of cotton, polyester, and nylon. This coat is only available in a stone-like color, but that’s all you need. By buttoning the top collar and turning it up, you get a look that is urban, stylish, and modern. 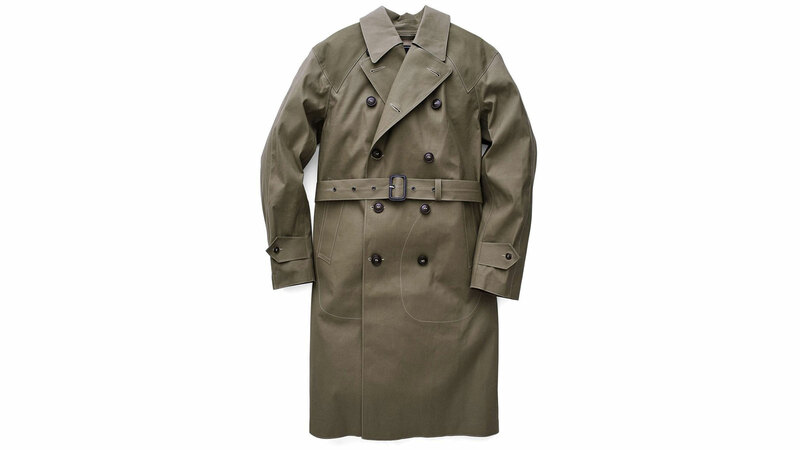 The Berrylook Lapel Men’s Trench Coat ($40) is a tough and comfortable coat with a very thick liner. That liner is one of the main selling points of the coat, as it keeps you warm in the winter. However, this might not be the best choice for those who live in a particularly hot climate. The large buttons combine with the straps and epaulets to create a striking and edgy look. The large buttons stand out from a mile away and are made so that the coat can be fastened in more than one way. This coat almost looks like the one worn by Michael Jackson on the cover of “Bad.” Of course, the design is a little more subtle and dignified than an 80’s album cover. The reinforced middle section makes this coat more than slightly durable. The all-cotton design is very resistant to all forms of wear, and the surface is treated to prevent staining. The Mango Technical Fabric Men’s Trench Coat ($150) is just brimming with ornaments, so it makes a good fancy option if you like that sort of thing. The large shoulder epaulets speak of royalty and make you feel like an important person whether you are or not. This coat is pretty expensive but should hold up for a long time. It’s made from a blend of cotton and polyester and is available in navy blue, khaki, or black. It also has a very high collar that can be turned up for extra resistance against the wind and cold. This makes it perfect for high-altitude areas where the wind is always whipping around. In the country, something that is very clean might be called “slicker than a hound’s tooth.” The Jose A. Banks Houndstooth Men’s Trench Coat ($130) reminds me of that old saying because it is totally minimal in its design. There aren’t even any external pockets, though there is one large internal pocket. If you want a sleek and suave look with nothing in your pockets, this one if for you. Here we have another high-quality trench coat from a trusted name. The Banana Republic Water Resistant Men’s Trench Coat ($269) is made in the classic style, and the double rows of buttons are obviously meant for both ornamentation and use. You will probably never use all of these buttons, but their symmetry does make the coat look nicer. Not everyone likes plaid, but it has the advantage of going well with almost any style of fashion. The Zara Plaid Traveler Men’s Trench Coat ($150) is obviously made with a post-modern look in mind and has no lining. Thus, we can tell that this isn’t a cold-weather coat. The high collar and sleek design give the wearer a touch of Victorian elegance. This one doesn’t come with a belt, as it is obviously designed to be worn open. With only four buttons, we can tell that this one is meant for style rather than anything else. This coat is still water-repellent for those rainy days in the city and is held together with heat-sealed seams for better durability. The Arc’Teryx Keppel Trench Coat ($332) is the most heavy-duty option on our list, though it is also the most expensive. This coat is expensive because it is treated with a substance called GORE-TEX. This is a rigid but flexible fabric that repels wind, water, and cold with great effectiveness. At the same time, GORE-TEX is also a breathable fabric. Products made of this material are usually sold for use in extremely cold weather. The breathable aspect of this fabric is important because of the problem of internal sweating. When you wear many layers of clothing in extremely cold weather, your body sometimes gets tricked into thinking that it’s hot. As a natural response, your body begins to sweat. Then, when you remove a layer, this sweat becomes a problem because now you are wet in the cold. Breathable fabric prevents this problem. This coat has two external pockets that are nearly invisible because they are located right along the seam of the coat. This thing looks great whether zipped up or left open. However, those who live in hot climates won’t enjoy wearing this coat. As you can see, the basic design of the trench coat has come a long way since world war one. We have coats that are meant for work, coats for both hot and cold weather, coats that are meant for a striking appearance, and coats that are just meant for display. Whatever your purposes, there is a coat that is designed just for what you have in mind. We hope that we have given you the information you need to choose one of these coats based on your individual style and preferences. If you have enjoyed this article, check out our article about 25 Of The Best Men’s Watches Under 300.